Madness, melancholy, insanity, lunacy, craziness, loco: a dizzying litany of words are used to describe a condition we don’t truly understand. Despite centuries of scientific study, many mental disorders remain untreatable and their causes not understood. The consequences are terrible, both in human suffering and the economic impact of millions of unproductive or destructive people. 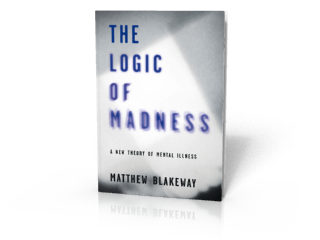 In assuming that mental illness is a mathematical problem, The Logic of Madness analyses how a human action can be deviant even when rational. It reveals that a person without a genetic or brain abnormality can have an apparent mental disorder that is entirely logical in its structure. Applying this mathematical rigour, creates a theoretical map of the symptoms and causes of mental illness and demonstrates how their origins are in human misunderstanding of emotion. The thesis of The Logic of Madness is that madness is rational and, with the surprising conclusion that it is a logic problem rather than a medical problem, shows that even human actions that are usually deemed mad are logically derived from a particular combination of manipulations of emotional behaviour. A new understanding of the structures behind symptoms of mental illness will hopefully give rise to more targeted therapies that will enable us permanently to escape entrenched patterns of destructiveness.